INOR Temperature Transmitters - INOR Signal Controllers | PICS, Inc.
Inor has over 70 years of experience in industrial measurement techniques. Their offering of process transmitters are available in both head mounted and Din-rail mounted configurations. These transmitters offer both a Voltage or Current 2-wire transmitter option. Also these transmitters can be selected to be installed in Ex, FM, CSA or Sil2 environments. The APAQ-H is an analog 2 wire temperature transmitter that is for Pt100 or Thermocouple inputs. Low profile housing and excellent reliability and industrial performance. 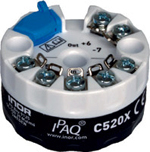 The IPAQ-HLP is a programmable 2 wire transmitter that is simple and easy to use. Setup time is greatly reduced with the windows software program IPAQSoft. The IPAQ C520 is a universal transmitter with additional voltage resistance input, also including many other features making it a highly accurate, stable, and reliable transmitter. The APAQ-L is an analog, adjustable 2 wire temperature transmitter for Pt100 inputs. The IPAQ-L is a programmable, basic, and non isolated 2 wire transmitter. Easy setup with a Windows user friendly configuration software.